My favorite way to cook dinner, one which you’ll probably see me employ over and over again on this site until you beg me to learn to cook another way, involves roasting. It’s a pretty magical process, that of turning bits of raw meat and vegetables into tender, sweet, crisp, delectable dishes simply by closing a hot oven door. Really, though, as wonderful as food cooked this way tastes, I don’t prefer roasting simply with flavor in mind. The true reason I love to roast is due to the method’s flexibility and forgiving nature. A roasted dish is pretty impossible to screw up. With your oven hot, and it doesn’t really matter how hot, add a bit of oil and seasoning and toss your barely handled ingredients into the oven, then cook until done. Or cook past done, if you’ve got vegetables in there – they’ll only get sweeter and more delicious. Roasting is incredibly practical, too, especially when cooking dinner just seems like another chore. With all the cooking done in one pan, cleanup is practically non-existent, especially if you’re clever enough to line your baking pan with aluminum foil or parchment paper – then entire cleanup process just takes crumbling up that lining and tossing it in the wastebin. As for the rest of the time you’re “busy” cooking, hop up on the countertop with a good book and tell people to please leave you alone while you’re getting dinner ready. This is a really lovely winter salad that would do well as an appetizer or side dish. To add a bit more protein and make it more appropriate for dinner, I incorporated some shrimp as well. We don’t often think about roasting shrimp (normally we have them boiled or grilled, or perhaps sauteed) but it’s such an easy way to cook them, especially if you’ve already got your oven hot. It’s harder to overcook them in the oven than it is in a pan and, most importantly, there’s no cleanup involved. Because of its color and scale, this dish takes well to a rustic presentation. I like to plate it all on one big platter and let people serve themselves from that, though you could plate individually, as well. Note that because the cheese and prosciutto are already quite salty, you may want to hold back on the salt when you season your finished dish. Butternut squash: Cut the neck off the squash, and then halve each of the two sections lengthwise. Scoop out and discard the seeds, and cut each of your sections into quarters. Place these segments onto a roasting pan and scatter some olive oil over them. With a pestle and mortar (or with the end of a wooden spoon in a small bowl), bash up your chile with the coriander and a very big pinch of salt and some freshly ground pepper. 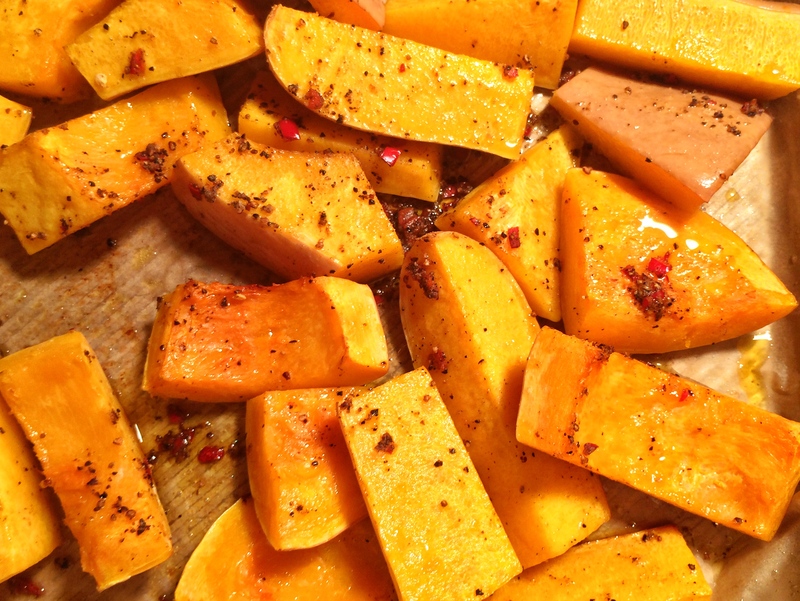 Rub this seasoning into your squash, and roast for 45 minutes. Squash will be tender and golden when ready. Allow to cool slightly before plating. 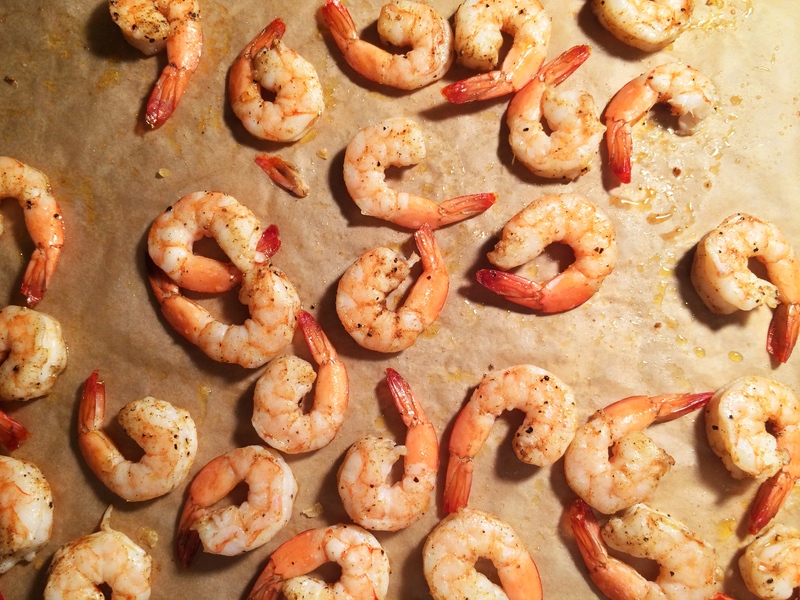 Shrimp (if using): Toss shrimp with a bit of olive oil and season with salt and pepper. Distribute on a parchment lined baking sheet. When the squash has only 10 minutes left on the timer, place the shrimp in the oven. Bake for 5 minutes, then carefully flip the shrimp, and bake for another 5 to 7 minutes until golden and pinky-white throughout. Plating: First lay your prosciutto on the plate. It will look nicest if you sort of let it fall onto the plate, twisting into little organic piles. With your hands, pull the squash apart into roughly 1-inch pieces, and tuck these amongst the prosciutto. Scatter a few handfuls of salad greens over the dish, tucking it in in places so that everything is visible. Drizzle balsamic vinegar, then olive oil, over the entire dish, and season with salt and pepper. Using a vegetable peeler, shave off shards of Parmesan over the finished dish. This entry was posted in Recipes, Salads, Vegetables and tagged arugula, butternut squash, cheese, parmesan, prosciutto, salad, shrimp, vegetables. Bookmark the permalink. I can’t wait to try this one!!! !